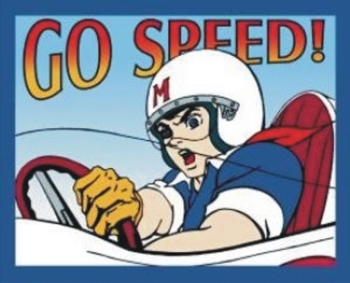 I have been a big fan of Speed Racer ever I since I was a kid. 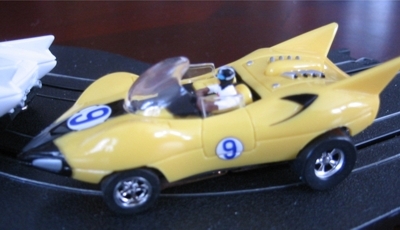 One I learned that Dash Motorsports was having these cars reproduced, I pre-ordered them right away. The cars arrived just when Dash Motorsports said they would. I was very pleased with the cars with one exception: there are no drivers! Well, that was easy enough to fix. I made up Speed from a RRR Tyco driver's head, and an RRR T-jet torso. 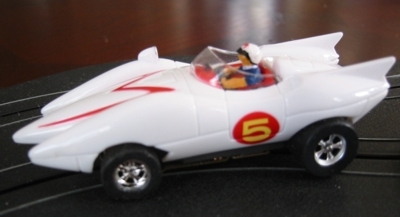 Racer X is made from a full RRR T-jet driver, with the head sanded round. As these cars are subcontracted from Round 2/Auto World, they come with the new Auto World/JL tuff ones style repro chassis which I am not a big fan of. I cut the body posts and slammed the bodies onto a pair of vintage T-jet chassis and added some AFX rear wheels and RRR front wheels. Yes, this required a bit of wheel opening... ahem.. 'adjustment', but the results speak for themselves. The cars now run as well as they look. A close-up of the Mach V.
And one of Racer X in the Shooting Star. 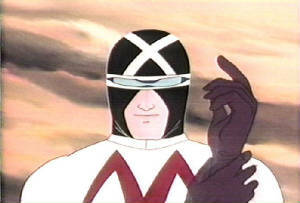 Racer X says: have fun, and drive safely!